1 medium apple contains 100 calories and 3 g of dietary fiber. 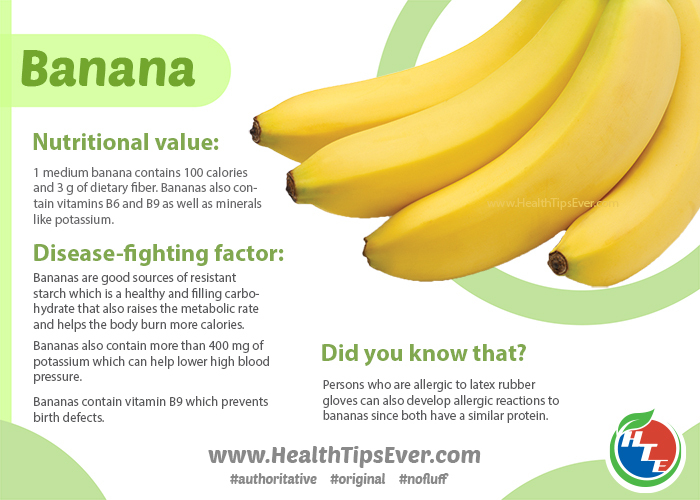 Bananas also contain vitamins B6 and B9 as well as minerals like potassium. Bananas are good sources of resistant starch which is a healthy and filling carbohydrate that also raises the metabolic rate and helps the body burn more calories. Bananas also contain more than 400 mg of potassium which can help lower high blood pressure. Bananas contain vitamin B9 which prevents birth defects. Persons who are allergic to latex rubber gloves can also develop allergic reactions to bananas since both have a similar protein.